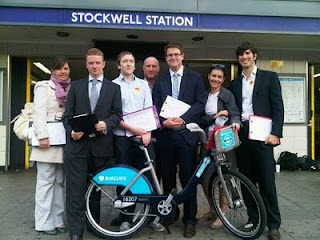 Stand Up For Stockwell: South London Residents demand – Bring the Bike Hire Scheme to Stockwell! South London Residents demand – Bring the Bike Hire Scheme to Stockwell! This morning South London residents joined Labour Councillors to launch their campaign to bring the TFL Barclay's Cycle Hire scheme to Stockwell. 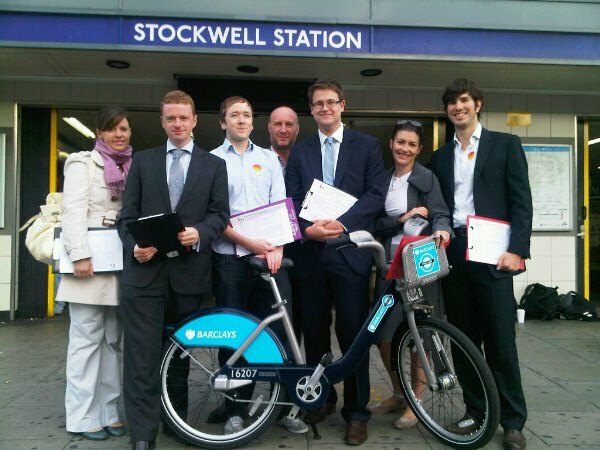 Local Councillors Alex Bigham, Imogen Walker, Peter Robbins and Pete Bowyer were outside the tube station asking local people to sign the petition calling the 'Mayor of London to extend the Barclay's Cycle Hire Scheme to Stockwell at the earliest possible convenience'. Over 120 people signed the petition in just 1 hour – a rate of 2 every minute. Many were concerned that the bike scheme docking stations are disproportionately located in North, rather than South London. The Cycle Hire scheme currently extends to Vauxhall, Kennington and Oval which boarder Stockwell. Extensions to the Cycle Hire Scheme will ease pressure on the very busy Northern & Victoria tube lines that converge at Stockwell. Pictured are (left to right) Alex Baker, Morgan McSweeney, Cllr Peter Robbins, Cllr Pete Bowyer, Cllr Alex Bigham, Cllr Imogen Walker and Jack Sutcliffe.